Hollister CenterPointLock Drainable Pouch is a sleek and low key ostomy pouch that provides an optimal amount of confidence and security via a CenterPointLock feature. This ostomy pouch combats unintentional pouching and skin barrier separation to create a pleasant, barely-there user experience. 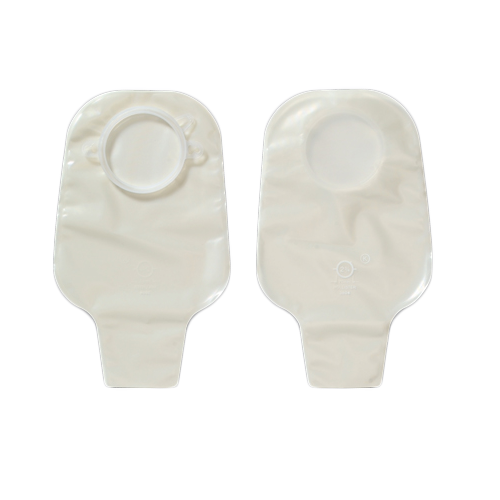 Available in either a transparent color or white color, this pouch is the ideal low-key accessory for any ostomy patient. Hollister CenterPointLock Drainable Pouch provides a high level of discretion with rustle-free, four-layer skin barrier film. Users can feel completely secure and at ease while using this comfortable and low-profile pouch made from high-grade, durable materials. You might also be interested in similar CenterPointLock ostomy pouch and skin barrier products that we carry, such as Hollister CenterPointLock SoftFlex Skin Barrier Flat. Safety and security in a pouch. This is something that I could not live without. I go out with it, eat with it and live with it, unfortunately because I have no choice. Having that in mind, I chose the Hollister Drainable pouch because of its durability. It gives me security that nothing will leak even if I do things I don't normally do. Also makes me feel safe that my body is taken cared of.